Update 10/4/18 – added a few new sentences to the conclusion. When you’re one of London’s most feted chefs, responsible for smash hits like the Chiltern Firehouse and Taberna do Mercado, then there’s only one thing left for you to do. 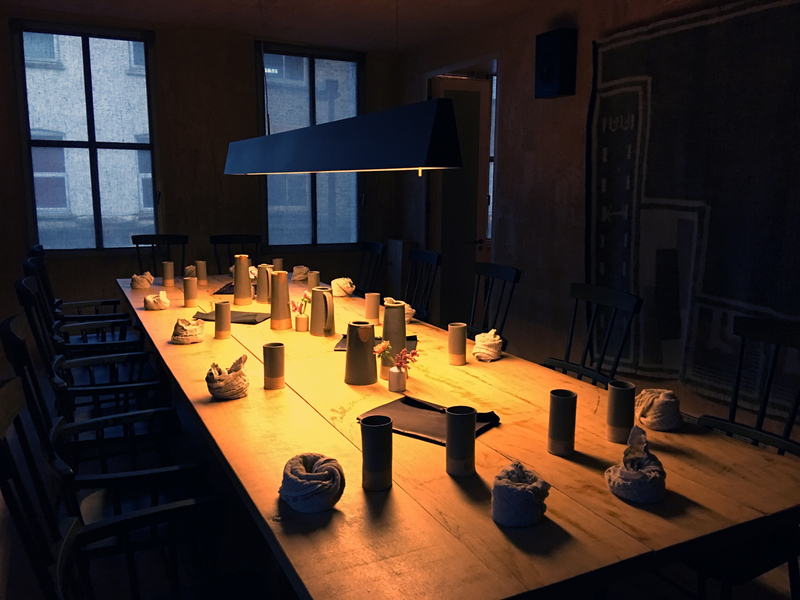 You open a secretive supper club in Shoreditch. If that sounds like an improbable series of events, then that’s because it was also unplanned – culinary superstar Nuno Mendes had originally planned to open a new version of his original London restaurant, Viajante, but his crowdfunding campaign fell short. The result is Mãos, which isn’t a homage to the Chinese dictator but one of the most spendy yet awkwardly normcore supper clubs you’re likely to find in the capital. 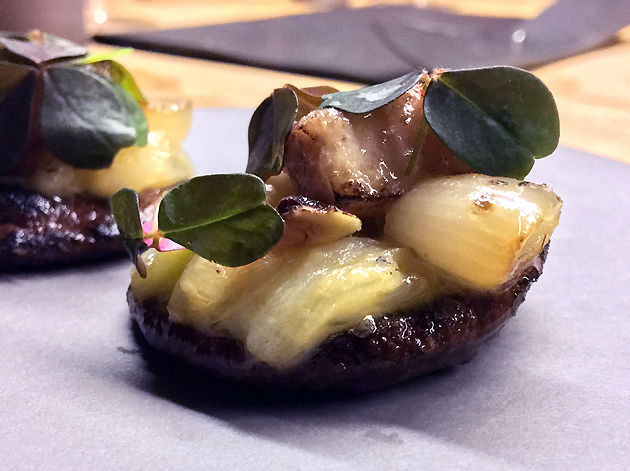 Mãos only serves one sitting of 14 people a night with a prepaid £150 tasting menu. As if prepaying well in advance wasn’t enough, there’s a seemingly endless series of confirmation phone calls and emails as well as a £350 hold on your credit card against which the cost of any drinks are deducted. If there’s a sure-fire way to stop your heart and empty your bowels simultaneously, then it’s suddenly seeing a £350 online banking notification from a generically named merchant account. Thanks Mãos. Despite all this amateurish booking palaver, the actual experience on the night at Mãos was smooth, polished and even somewhat homely. Once you find the grey, unmarked door on Shoreditch’s Redchurch Street and ascend the decidedly non-wheelchair friendly staircase, service was unfailingly warm and attentive – which isn’t a huge surprise with two servers looking after just 14 people. That cosy setup means you’ll get to know your other diners, whether you want to or not. Given the high price, the celebrity chef lineage and the location, the crowd was a tad Hampstead socialist on both my visit and The Euro Hedgie’s. Conversation was rarely dull or uninformed though, with scintillating anecdotes, wry insights and the occasional off-colour joke lasting well past the four hour service had finished with no pressure to vacate the premises. You can wander around freely from the dining room and bottle-lined drinks room to the small but well-equipped kitchen. There’s even a small, but handsomely well-manicured smoking deck. The roughly hewn walls in the spotlit dining room look a bit like a Cappadocian cave if your imagination is as active as mine. You can eat at the table or with plate-in-hand on a kitchen counter while watching the three-person kitchen crew at work, as if it were a house party. 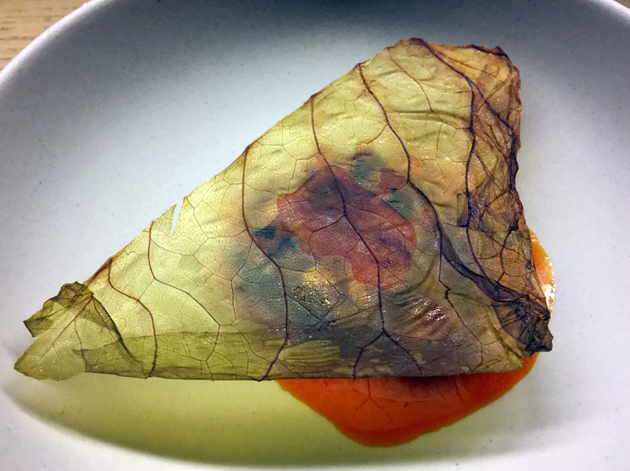 Mãos may be nothing more than a fancy supper club underneath all its deliberately enigmatic non-marketing, but it does feel deliberately designed to appeal to high-spenders put off by even the vestigial formalities of fine dining in a London’s other haute cuisine restaurants. The roughly hewn aesthetic extended to the handsome water carafes, mugs and napkins too. 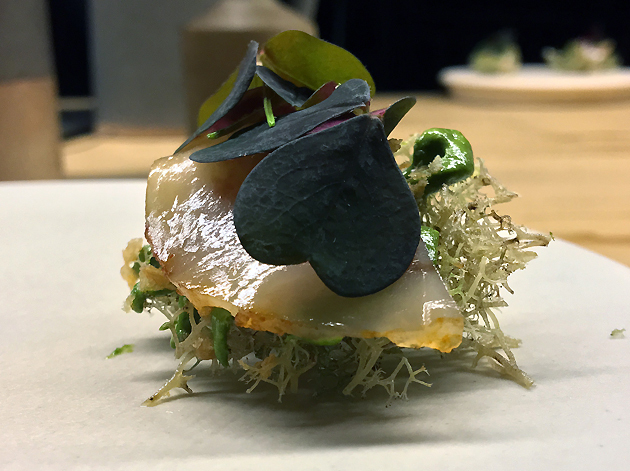 Yes, the food at Mãos is unapologetically, undeniably haute and modernist. An amuse bouche of trimmed scallop in wasabi leaf was a poor start though, with the vegetal crispness of the leaf dominating proceedings. 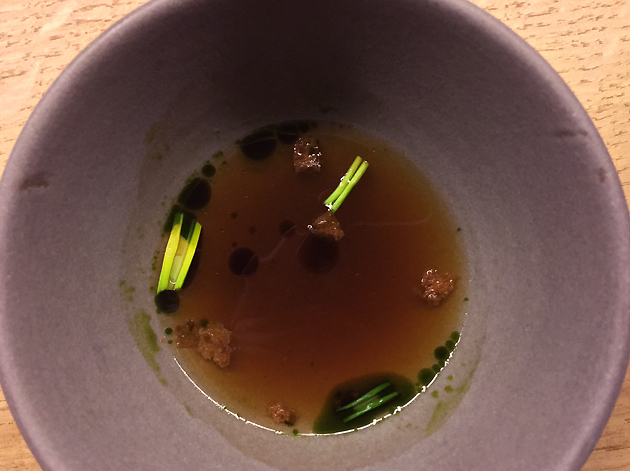 Consommé was far better, although I’d never have guessed it had been made from celeriac and pork fat if I hadn’t been told – the sweetness of the thin liquid tasted more like goji berries to me. A morsel of wagyu short rib was superb, with the beefy tang mellowed by buttery unctuousness. Sorry folks, I forget to photograph all of the amuse bouche. Lardo, chicken skin and sorrel was sparklingly zesty and delightfully but not overpoweringly fatty, with all of the elements neatly complimenting and/or offsetting each other. There’s low-profile, then there’s Mãos. 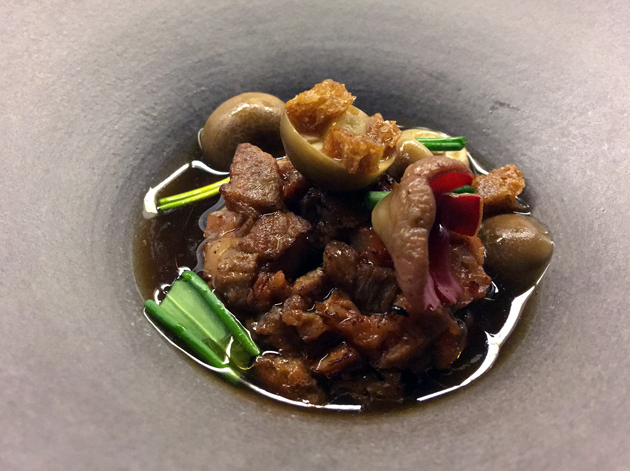 A distinct Japanese influence could be felt at Mãos, not only in the kaiseki-like structure of the tasting menu but in many of the individual dishes too. The most obvious was the chawanmushi which was one of the best I’ve ever had, both inside and outside of Japan. 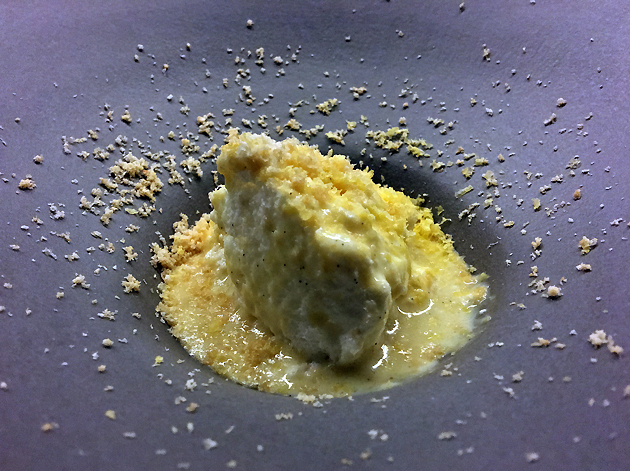 Custardy with a gentle kombu-esque umami and a shiitake-like earthiness, I scraped up every last bit with my spoon. The least ‘attractive’ dishes are often the best. From here on out, quality became even more uneven. Unlike the Euro Hedgie, I was entirely unconvinced by the minced red prawn and cabbage. Finely dicing the prawns robbed them of both their quivering texture and their heady evocation of the sea. 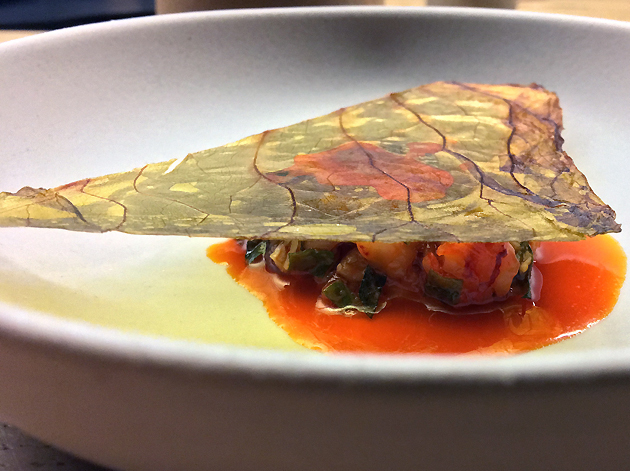 The earthy smokiness and unexpected fruit roll-up like texture of the dried shiso leaf balanced on top was this dish’s only saving grace. Wagyu made a repeat appearance. Although the beef was also finely chopped, its delightful smoky butteriness came through unimpeded. Apparently a last minute substitute dish, but you’d hardly know it. 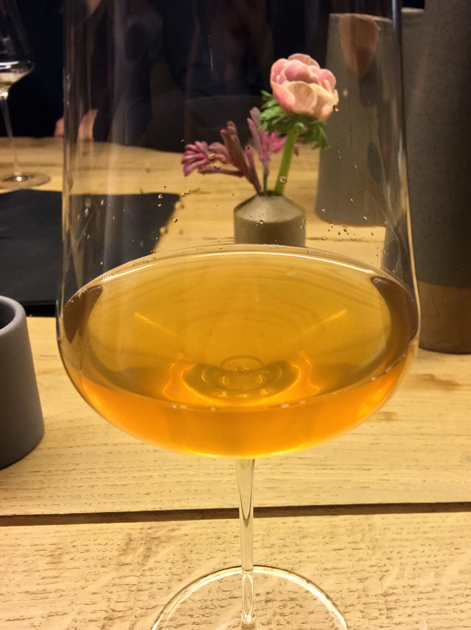 A kombucha palate cleanser tasted a bit like an apple Tango in all its fruity sourness, but with more of the creamy cloudiness you’d get from actual apple juice. It multilayered taste did mean it wasn’t entirely successful as a palate cleanser though. You know when you’ve been Tango’d. Dense slices of red sea bream didn’t just rely on their citrusy tinge for charm. 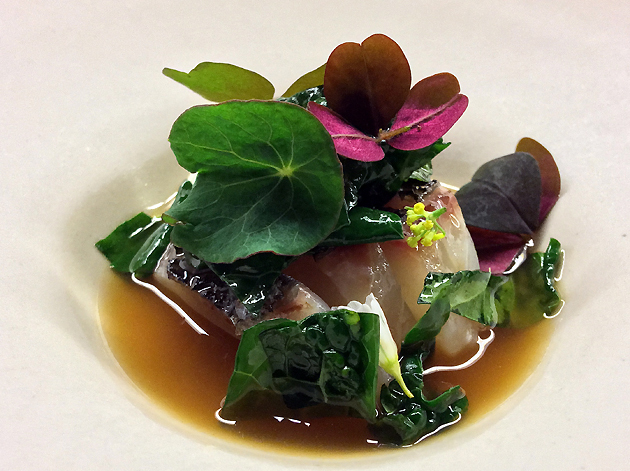 The umami broth and the aniseed-ish leaves proved surprisingly complimentary, adding plenty of depth and character to the fish. 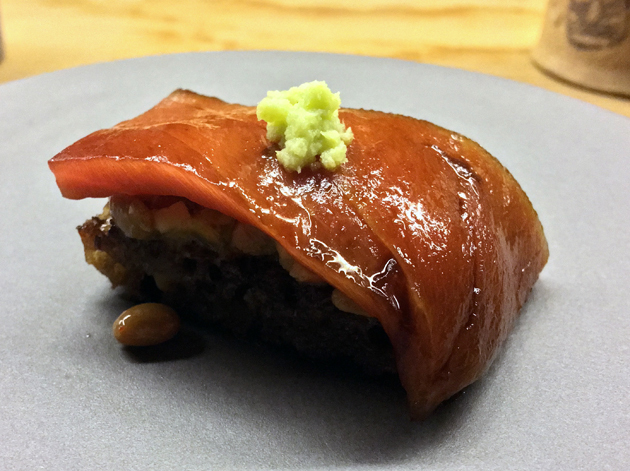 It takes a certain kind of talent to not only make aged tuna belly uninviting and tasteless, but to do the same to natto and then pair them together on stodgy sourdough to drearily unspectacular effect. If it wasn’t for the creamy sweet warmth of the wasabi, I’d have been tempted to tip this out of a window when no one was looking. 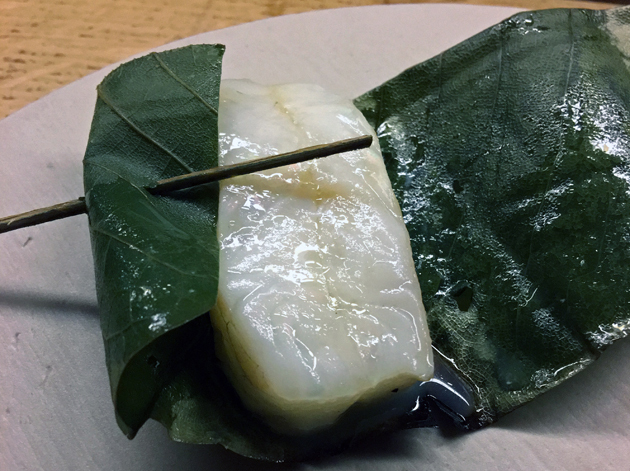 A milky, meaty stick of adeptly prepared turbot, sticky with umami, came with sauerkraut-like cabbage. The neat balance of fruity sweetness and tanginess in the cabbage was almost enough to make me forget about the whole turbot available just down the street at Brat. Almost, but not quite. Don’t worry, I’ll be wrapping up this review soon. Although the stodgy beetroot flatbread was about as enticing as a soiled sock on a rain-slicked pavement, the toppings were a different matter all together. 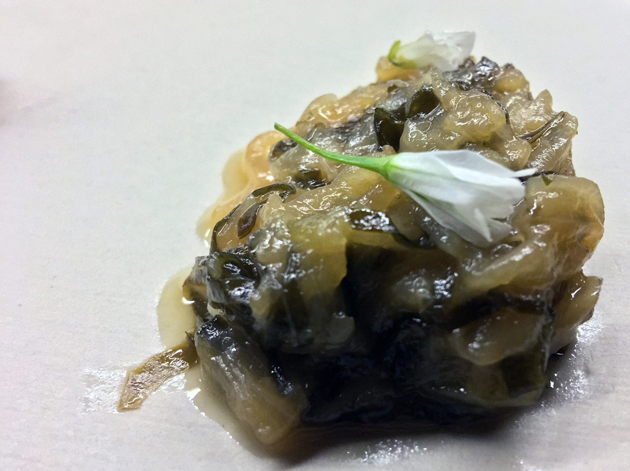 The unctuous cubes of bone marrow and the sweet-sharp tang of the onions were a riotously perfect pairing. Where do they find all these tiny little leaves? The Euro Hedgie waxed lyrical about the smoked Kobe beef. Apart from a brief hint of butteriness though, I found the bovine strip to be a languid, joyless experience. 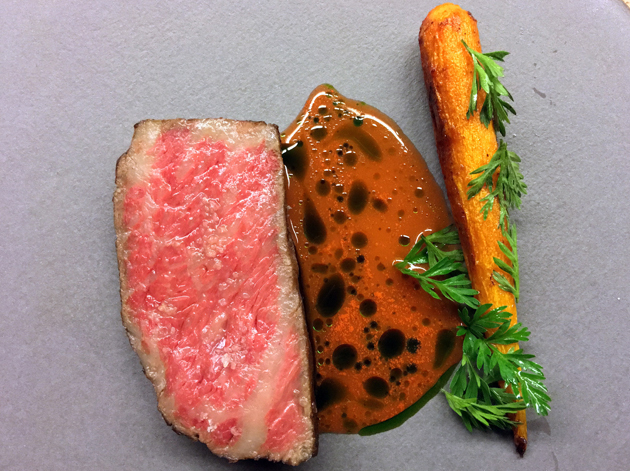 The lean and characterless beef was livened up by the yeasty, booze-soaked carrot and the sauce which was a dead ringer for carrot juice, but all that was too little, too late. 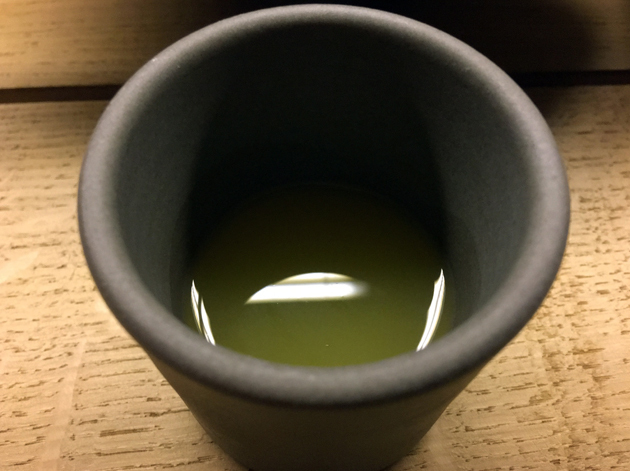 ‘Bone broth’ unsurprisingly tasted like beef stock, but spiked with a strong hint of garlic. Pleasing, despite the risible name. ‘Bone broth’ is still a thing, apparently. Sigh. The oddly marshmallow-like poached meringue served in a milky, lightly almond-inflected sauce was less a dessert and more a startling vision of the formless, inoffensive mush that will be fed to me through a tube if I manage to live to a ripe old age. I stared into the void and the void stared back. 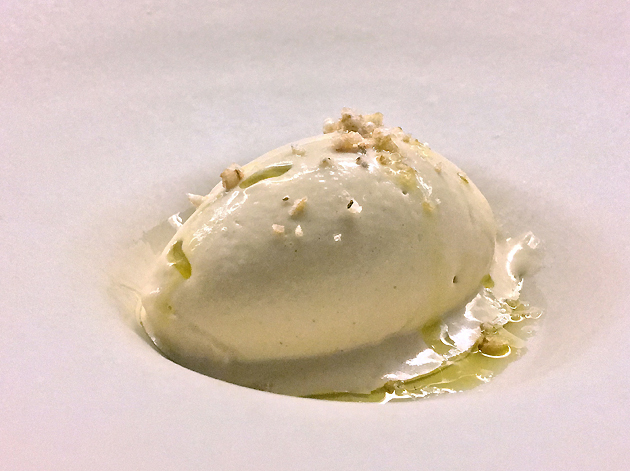 Smooth, light and refreshing ice cream had a strong initial hit of bergamot. The promised koji berry and honey ‘cap’ flavours were so hard to detect though that they might as well have not been there. There’s the core of a good dessert here – it just needs more refinement. This review’s procrastination was brought to you, in part, by Mr Robot. The soft drinks were truly remarkable, in both good and bad ways. The barley water smelt like Shredded Wheat (which isn’t a bad thing in my book) and had a complex, nuanced taste that’s best described as smoky pear. 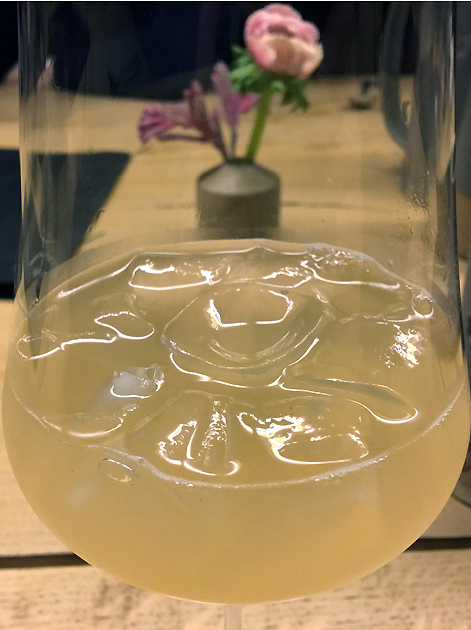 The iced tea was almost as good, its mild fruity sweetness and mellow tannic flavour sitting easily on the tongue, rather than overpowering it. Two glasses of each were enough to rack up a drinks bill of just under £35 (although it’s currently unclear if that figure also includes a service charge or not). At least, as a non-drinker, I now know how booze hounds feel when they spend as much money on drink as other people spend on food. Table flowers deliberately included in the shot as, let’s face it, beige liquid looks pretty boring on its own. 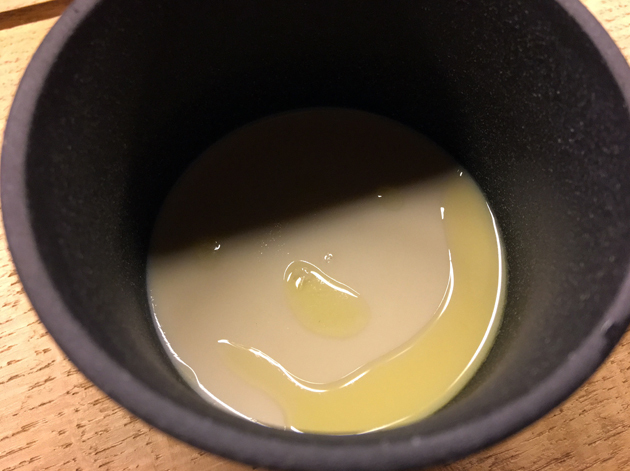 Golden liquid isn’t terribly exciting to look at either. Few eateries have been as polarising in my experience as Mãos, with the restaurant/supper club igniting a blazing, thunderous row between myself and my dining companion. The Euro Hedgie was bowled over, while my own feelings are far more mixed. While the overall experience was undoubtedly intimate and convivial, providing a possible template for others to use in attracting novelty-seeking high spenders, in the end this is outweighed by the booking palaver. In trying to physically separate the grubbiness of commerce and money-handling from the constructed homeliness of the night itself, it ends up adding just as many rough edges as it smooths out. Even more critically, the markedly uneven quality of the overly cerebral, overly tweezered cooking is just unacceptable at such a high price. There isn’t, as far as I know, anything else in London quite like Mãos. For now, I’m counting that as a blessing and a relief. Opening Hours: Tuesday-Saturday. Timed entry at 19.00-19.30. Tags: beef, cabbage, carrot, fish, ice cream, iced tea, lardo, london, maos, menu, meringue, natto, prawn, restaurant, review, sea bream, supper club, tofu, tuna, turbot, wagyu. Bookmark the permalink.